You’ll probably know us already for producing great print. But we’re quite a modest bunch really so you may not know that we do a whole lot more than just put ink on paper. 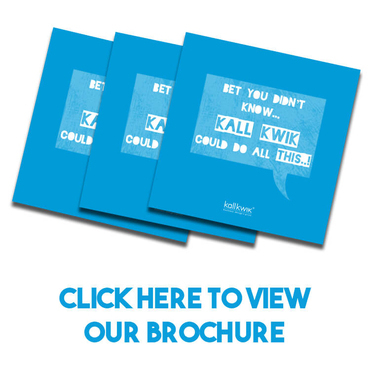 We provide a one-stop design, print and on-line solution for businesses who want to make sure they communicate the right message whenever they talk to their market. We do this by having a team of graphic designers, print specialists, web designers and marketing professionals who are all totally focussed on making our customers look good in print, on-line and wherever their brand is seen. We’d love to do the same for you as well, as we think once we’ve worked with you, you’d be pretty pleased that you’d made the right decision. As part of the UK’s premier print and design network you can be confident that your design and print requirements are in safe hands. We’re local, working with businesses across Birmingham, Colmore, The NEC, Selly Oak, Harborne, Edgbaston and beyond so don’t be afraid to pop in and see us, we’re quite a friendly bunch really! Being so local we can save you critical hours when you're up against a tight deadline. So when you need a rush job or same day printing is all that will do, remember we are just around the corner. Like to find out more? Have a look through our website to see just what we can do - we think you’ll be pleasantly surprised at just how we might be able to help your business. And then just pick up the phone and call 0121 212 0500 or send an email to fnyrfj@xnyyxjvxovezvatunz.pb.hx.